This is an article from Dr Christopher Ng on the Spectra VRM III Laser Treatment combined with Omnilux LED Phototherapy. What is a Spectra VRM III Laser Treatment? 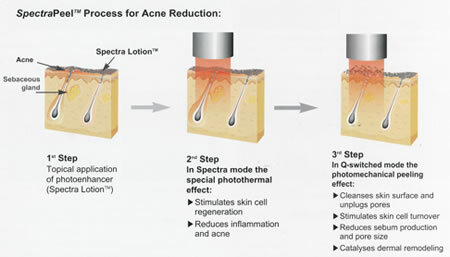 When would you need the spectra laser treatment? This Spectra laser treatment avoids prolonged downtime and PIH (post inflammatory hyperpigmentation) – common with AHA / TCA chemical peels and ablative CO2 lasers. 2nd pass in Q-switched mode causes explosion of the fine carbon particles which has a photomechanical effect, exfoliates the outermost layer of skin (stratum corneum), shrinks pores, reduces sebum production to reduce acne, stimulates collagen remodelling, penetrates deep into dermis fracturing melanin that causes uneven pigmentation and stimulates natural phagocytosis processes to remove the unwanted colouration. All resulting in cleaner younger looking skin. Omnilux LED phototherapy (lights-only) is an FDA approved procedure used to enhance and improve skin treatments (after Botox®, fillers, facial peels, microdermabrasion, lasers and IPL therapy). It reduces side effects and speeds up the regeneration time. Dr Christopher Ng practices at GynaeMD Women’s & Rejuvenation Clinic, located in Camden Medical Center Singapore, which offers obstetric, gynaecology and aesthetic services in Singapore. Previous post: Do you believe in dressing ‘age appropriately’ and what does it mean to you?